After all....who doesn't love Pixies??? And we've got 5 enchanting little Pixies in this collection!!! They are sweet, beautiful and, above all.....playful! 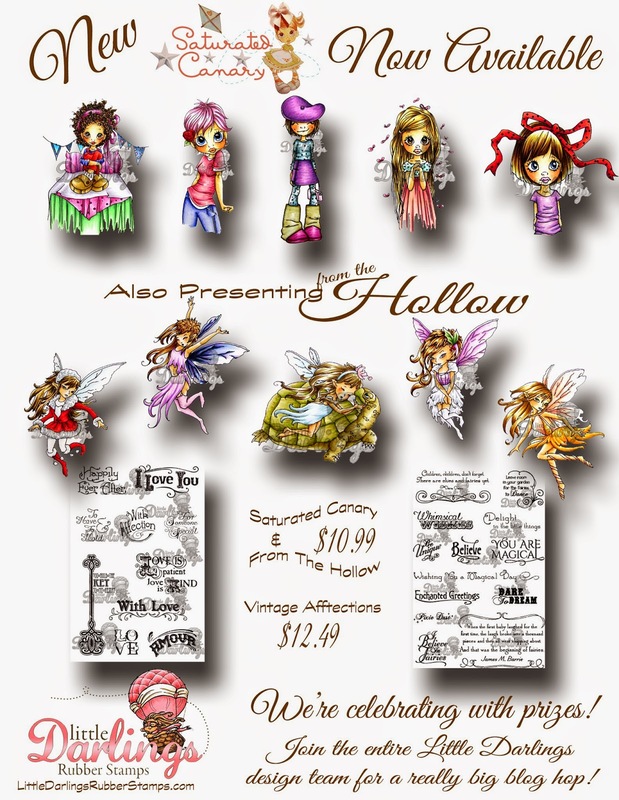 They are sure to fulfill your sense of wonderment and love of tiny creatures From The Hollow. Use them on all of your crafting projects for your children, friends, and for yourself! We've also got a stunning Saturated Canary rubber stamp collection! There are 5 gorgeous girls in this collection. As always, they are sweet, whimsical and perfectly poised for all your crafting needs. We've paired these collections with two elegant sentiment sets: 'Love' and 'Enchanted Wishes', from our Vintage Affections product line. These sentiments are the perfect choice to add to all of your cards, tags, scrapbook pages, altered projects, and more! And each offers it's own interpretation of Victorian elegance! All stamps in these collections are individually backed with cling foam and contour cut. 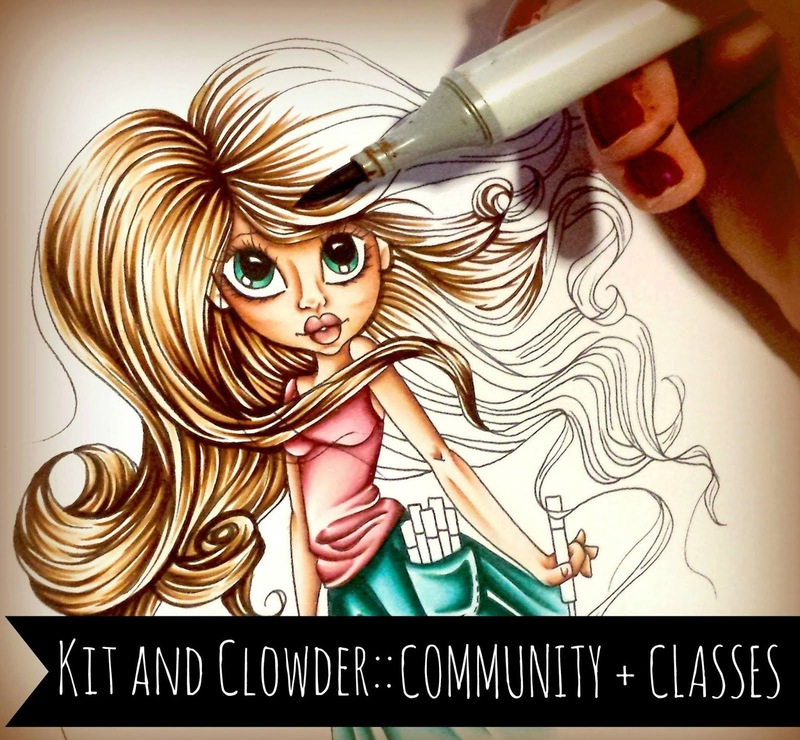 This collection is available at LDRS and many of your favorite craft stores! We are giving away 4 rubber stamps from this entire collection to a randomly selected winner! The winner will receive 3 character stamps and 1 sentiment set. 4. Head back to the Inspiration Blog HERE and leave your name in the inLinkz collection. Team B "From the Hollow"
This is my card which I've made with the stamp From the Hollow - Turtle Love. The papers are from Maja Design - Walking in the Forest. Love the colours of the Autumn. At the edges of the card you see the gorgeous border die 6002/0357 from Noor! Design. I did some Inka Gold - Alt Gold on it for a metal look. Behind the flower you can see the square die 6002/0257. Also the small leaves are made with this die. I made the Bingo Cards with the stamp 6410/0098. I coloured the image with my l'Aquarelle. 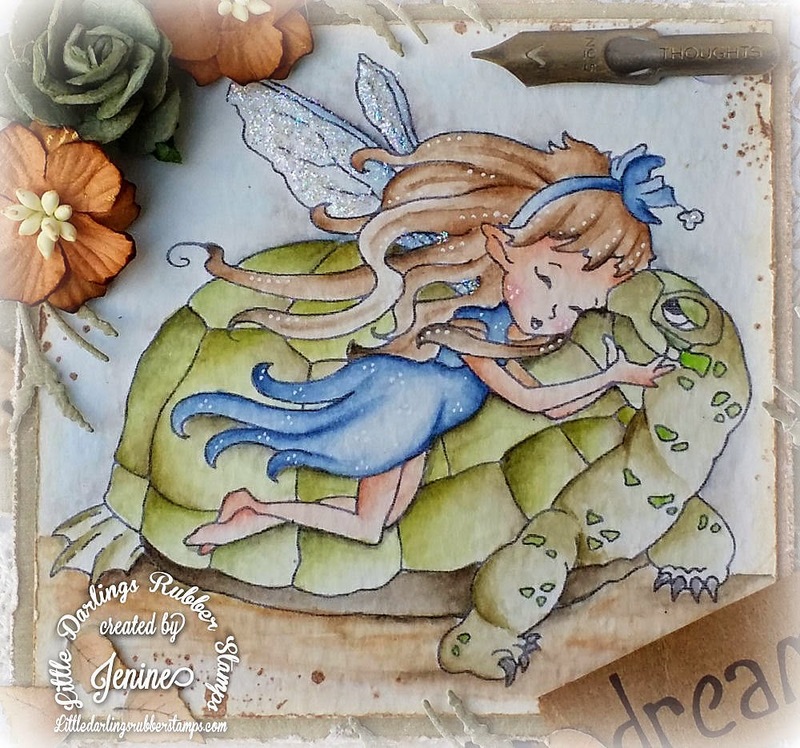 I hope I can give you some inspiration with this stamp "Turtle Love"
Oh nog zo'n leukerd! 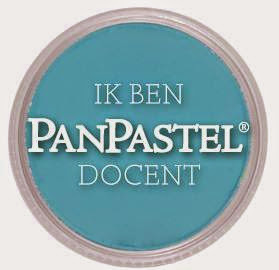 Leuke kaart. Such a cute card! Love everything about it! Cute stamp. Beautiful card. Love all the embellishments and flowers . I am hopping along on the LDRS Release Day hop. I love this card. Colors are wonderful, and the image is so playful! Thanks for sharing! A dazzling and dreamy creation with all cuteness!!! Love all those gorgeous dies and flowers and a corner too , totally awesome!!! This is amazing, I'm glad I got to see the turtle image colored up! I love that border with the gold, so pretty! Such a pretty card! I love the color combination and the flowers! Wow! Beautiful! Those borders are wonderful! 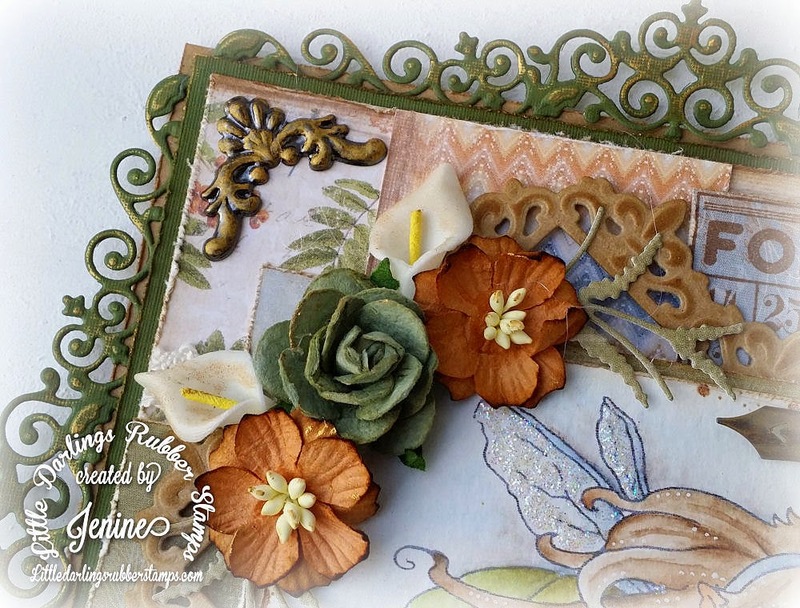 I'm hopping along on the LDRS blog hop. Great watercolouring and so appropriate for a water-lovin' turtle ;-). I'm not sure who's expression is cuter... the pixie's or the turtle's. This image is adorable. 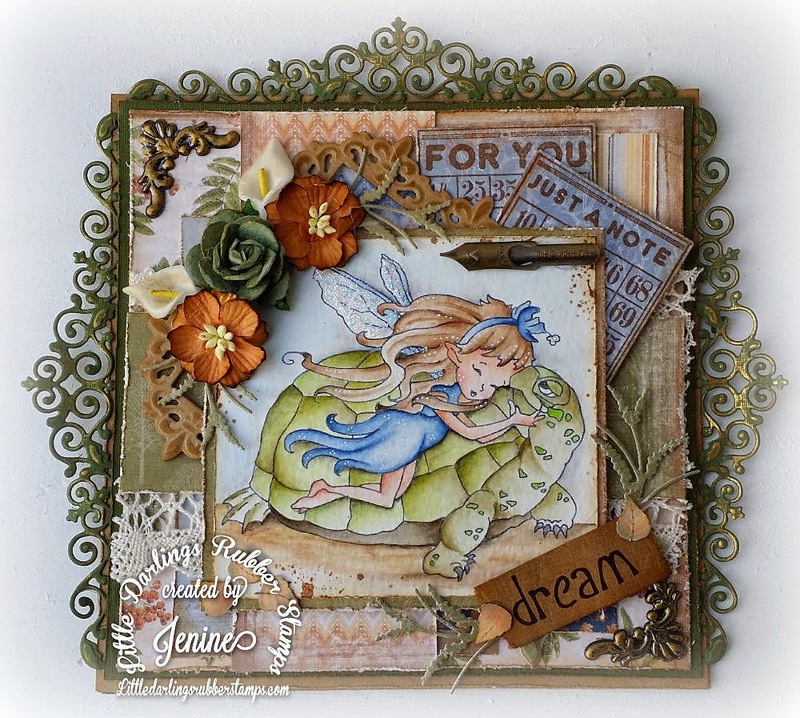 Super project, it's so cute the fairy hugging the turtoise. What a cutie! Gorgeous details! This is so precious! I love her! OH WOW!! Adorable image!! I LOVE the colors you used on your card!! Love the turtle! so cute!! love your card and love this adorable image. Stunning! Love the colors and the use of the dies! Such an inspiration! Makes me want to create! Thank you for this awesome LDRS hop! Wow!!! 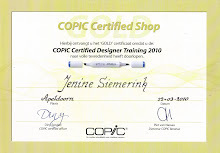 I love this Jenine!! I love the colors you used and the touch of gold on that GORGEOUS border!! Those flowers are perfect. Thank you for sharing and inspiring us all. oh how precious is she. I love this with the turtle. So pretty and I love the accents you added. So gorgeous. So pretty. I love the color combo! This card is absolutely gorgeous! I love the dies that you used and the great colors. Gorgeous card Jenine! great use of dies a fabulous coloring! wow! this is one very stunning card, the most gorgeous design! Fabulous card..love the colors and design! Very nice! Loving those flowerers as well! Love the coloring and all the textures, adorable. She is so sweet with her turtle! I love all the different elements on this! Inka Gold is something I have recently discovered - I wish I could get every color - lol! Awww! This is so cute! I really love how you colored this! This image is absolutely adorable! I love all of the dies. Your card is very pretty!